In the last installment we discussed the principle of Engaging Conflict: the need to acknowledge the places of difference as they exist in our families, congregations and communities and be forthcoming in addressing and transforming any destructive energy that arises from pursuit of different goals, values, or interests. To best engage conflict the JustPeace Way encourages Welcoming Conversations. As we use the term, welcoming conversations has a double meaning. First, we should be very receptive — welcome – to the possibility of being in open and honest dialogue with those who hold or represent different, and from our perspective, problematic viewpoints. Secondly, when we have opportunities to encounter different interests, values, goals, or perspectives, the conversations we create should have a welcoming quality. To accomplish the first requires an attitude, the second would benefit from skills and support. If their opinion and values are so radically different from mine, it is probably also true that their life experiences are very different. I wonder what life experiences they have had that caused them to arrive at this point of view? If I accept that I don’t know everything, my ideas could be improved by the wisdom of others. What can I learn in this encounter that might improve the path I’m on or even change my direction towards a more positive end? Modern neuroscience suggests that at every moment there are almost 11 million data points that could be observed and that the most conscious and mindful people can only focus on 100 or less. Since there are so many possible observations to be made at every moment, I wonder what I might have missed or observed and given a different meaning? The types of questions that spur what Edgar Schein would call an Humble Inquiry (2015) are the questions we can pose to ourselves to make welcoming conversation our reflexive way of being. And once we are welcoming of conversations, there are steps we can take to make conversations welcoming to others? Ask yourself: what would it take for me to be willing to enter into a conversation that I know is going to involve conflict, high stakes, and deep emotions? How would the conversation be structured so that I could feel free to fully express my emotions and not be criticized or made wrong for having strong emotions and different feelings? What is the forum or structure and who are all the types of people that would need to be involved for me to know that my ideas could be fully considered, that I could express my differences and yet take time to name my assumptions and express areas of doubt? Brown, Juanita with Isaacs, David (2005) The World Café: Shaping our futures through conversations that matter. San Francisc, CA: Berrett-Koehler Publishers, Inc. Please also think of JustPeace as a helpful resource. 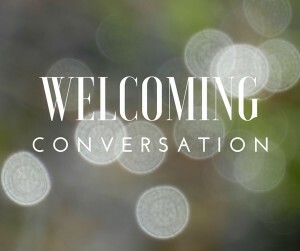 We welcome conversations about constructing welcoming conversations in your context.